This week: San Antonio hits a Level Two Heat Advisory, what the new anti-idling ordinance means; more on the Brackenridge Park draft master plan and a look back at San Antonio Pride festival and parade. The San Antonio Metropolitan Health District issued a level II “heat advisory” this week, indicating a sustained heat index greater than or equal to 108 degrees Fahrenheit or air temperature greater than or equal to 103 degrees Fahrenheit. At NOWCastSA we’ve got a map of “Cooling Stations” -- places that are free and open to the public so anyone can find relief from the heat. This is when our public libraries become a big part of the community safety net. The Cooling Stations include Central Library, 25 branch libraries, community centers and senior centers. Seniors living in homes without air conditioning or circulating air face a greater risk of heat-related injuries and fatalities during the summer. Besides the free cooling stations, any senior is eligible to receive a box fan free of charge just by calling 2-1-1. And you can help: Click here to use our map to find the nearest fire station where you can donate a fan or make a donation to Project Cool. What does San Antonio’s new anti-idling ordinance mean? Well, enforcing the new rule could contribute to a 20 to 25 percent cut in ozone and mean easier breathing for everyone. Ozone oxidizes epithelial cells in the lungs, causing damage that some sensitive people -- children and seniors, for instance -- take longer to recover from. Along with the anti-idling ordinance, the City Council approved a ban on coal-tar sealants in pavement products setting a citywide standard to improve the quality of the air and the water. Check out our story here for more details on enforcement, penalties and exceptions to the rule. Your neighbors continue to speak out about the Brackenridge Park draft master plan. There are two more public meetings to discuss the draft plan on July 7 and July 13. NOWCastSA would like to be there with our cameras, but as a 501(c)(3) nonprofit, we rely on your support to make coverage like this possible. 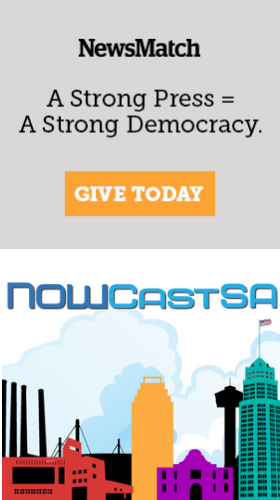 Head to NOWCastSA.com now to make a tax-deductible contribution. This year's Pride festival and parade was full of energy and passion, along with respect and tributes to the shooting victims at Orlando’s Pulse nightclub. Click here to see how we collected your social media photos and images together for a story, and see a slideshow of artful images by photographer Antonia Padilla.